It was a beautiful sunny Saturday and a lot of people were out and about. 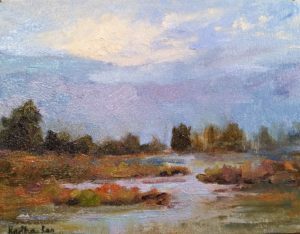 I set up to paint by the Marshes in Palo Alto, Bay area. I started with a wash and set about mixing my colors. 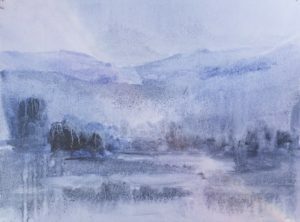 I mixed some pale lavender and pale misty blue for the back ground hills and the foreground I mixed some greens/yellows/orange. For the sky I simply used paler versions of the color of the hills. The wash is with a mix of Greys/Blues. My wash is key, as it sets the tone for my painting. I spend a lot of time and put a lot of thought into it. This is where the foundation of the painting is laid out. This wash turned out really good, in fact one passerby suggested I leave that as is and start painting another one. Maybe I should have listened! In this painting I feel like I was successful in capturing a feeling of being in a distant place, far far away. People stopped by to chat and ask questions and I always welcome that. Its fun to paint outdoors!